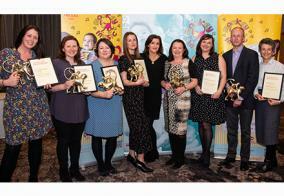 Congratulations to the winners of our Monkey Music Franchise Awards who received their gold 'Moscars' at our Annual Franchise Conference recently. Pictured from left to right with Monkey Music's CEO and Founder, Angie Coates, are Lucie Jennings - Monkey Music Berkhamsted & Rickmansworth, Elen Mon Wayne - Monkey Music Amersham, Beaconsfield & The Chalfonts, Paula Taylor-Williams - Monkey Music Winchester, Chandler's Ford & Fareham, Amy Thatcher - Monkey Music High Barnet, Mill Hill & Whestone, Clare Fulthorpe & Emma Playle - Monkey Music Leatherhead & Dorking and Richard and Flick Moorhouse - Monkey Music Oxford. We're so lucky to work with such a great team of talented and dedicated people!